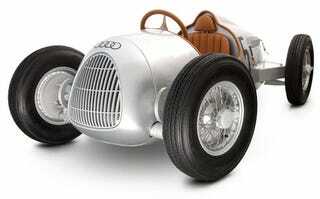 If you're looking to spoil your kid rotten, here's a $13,300 replica of an Audi Auto Union Type C roadster, a perfect 1:2 scale copy of the classic Grand Prix race car. Your kid will be relatively safe inside, too, because there is no engine—it's a car that only goes fast as the little tyke can pump its pedals. This is not just any stupid kiddy car, though, it's built to the same standards of a fine full-sized automobile. One more beauty shot, after the jump.